Expert report: "Effective Arrangements for Waste from New Reactors Do Not Exist"
"Nuclear Reaction or Nuclear Resurrection?" Nuclear waste is not your friend! Nuclear waste is very long-lived and extremely dangerous. High level nuclear fuel waste is created when nuclear power is used to generate electricity. The waste is a radioactive poison, and includes hundreds of different isotopes, or radiation-producing substances. Even low doses of radiation emitted by the waste can cause cancer, birth defects and other health problems. The waste is lethal and must be strictly isolated from the environment for hundreds of thousands of years. If the wastes leak into the environment, the radioactive elements will contaminate the soil, water and air. Nuclear power production began in the 1970's, before the government or the nuclear industry had any safe means of storing or disposing of the highly radioactive wastes. In 2002 the federal government passed the Nuclear Fuel Waste Act which put the nuclear industry in charge of researching nuclear waste management. The Nuclear Waste Management Organization was created by Ontario Power Generation, Hydro Quebec and New Brunswick Power. The first step is a nuclear phaseout. The Nuclear Waste Management Organization says that energy policy is beyond their mandate, but the problem of nuclear waste is unsolvable as long as the waste continues to be produced. At the end of 2004, there were 1.9 million fuel bundles or 45,000 metric tonnes of nuclear fuel waste. By 2009 there were over 2 million bundles. Without an early phaseout, that amount will double. If new reactors are ever built, the volume will rise even higher. Conservation and alternative energy sources can and must replace nuclear power. Conservation and alternative energy sources are cheaper, cleaner and more reliable. In 2007 the federal government "selected" the Nuclear Waste Management Organization's proposal to bury nuclear waste, calling it "vital to the future of nuclear energy in Canada". The announcement was almost simultaneous with the NWMO's launching of what would be a two year exercise to design a site selection process. The ten year site selection process was officially launched in May 2010. In September 2012 the NWMO "suspended" the call for expressions of interest from communities willing to be studied as possible nuclear waste burial sites. By November 2013, twenty-one communities were being studied. In November 2013 the Nuclear Waste Management Organization (NWMO) announced the completion of the first phase of preliminary assessment (Step 3, Phase I) for eight of the 21 communities being studied as possible nuclear waste burial sites. 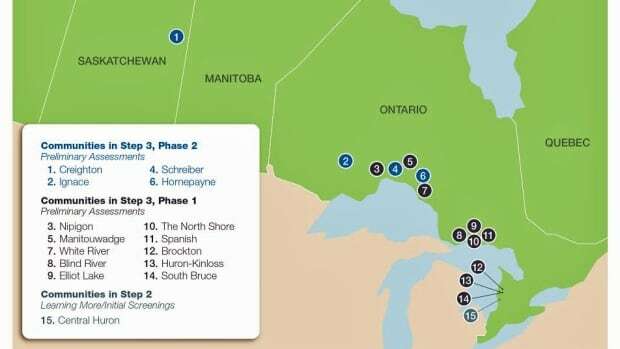 Creighton in Saskatchewan, and Ignace, Hornepayne and Schreiber in Ontario have been identified for "further study". English River, Pinehouse, Ear Falls and Wawa were dropped from the NWMO list. In mid-January Saugeen Shores and Aaran Ederslie, both in Bruce County, were dropped while still mid-point through Phase I of Step 3. Fifteen communities remain on the NWMO list of candidate sites. In November 2005 the Nuclear Waste Management Organization recommended something it called "Adaptive Phased Management" for the future management of nuclear waste, saying it combined all three of the federal government's "options" in a 300-year phased approach moving from storage at nuclear plants, to centralized storage, and finally to deep rock disposal. In the first phase of the NWMO plan, the waste will remain at nuclear plants for 30 years while a centralized site is selected. In the second 30-year phase of the NWMO plan,an underground repository will be constructed. During construction, the wastes will either remain at the nuclear plants pending completion of a site research and construction of a deep geological repository at the site, or the waste will be moved while research is still underway, and placed in storage - possibly in a shallow burial site - at the same location. After the repository is constructed, the wastes will be placed deep below the surface in a series of underground caverns. The repository may or may not be closed after the following 240 years.